There is something special about the place that we belong to, in a way or the other it just runs in our veins. Look at or hear to someone, you know where he or she comes from. On fair occasions life does give us chances to look back at our roots. Fortunately I am getting to look at and live in it for three complete years. 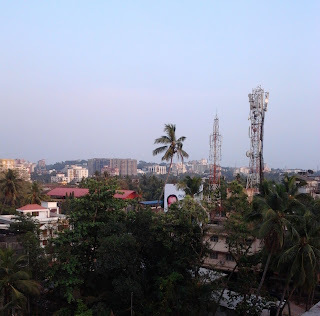 It has been close to a year in Mangalore and there are many things that I have come to know about this hometown of mine during this period, of which previously I was not very aware. There is more to this place, more than the world thinks. Come summer, come rain an umbrella is something which you cannot do without when you are on the roads. You may forget your wallet, you may forget picking up your friend but never forget carrying an umbrella, never! If you do, well you shall pay the price! “Ponk ponk pon” hear this and you know you are in the lanes of Mangalore. Here buses run like rockets. Traveling in them in and around the city is a weird pleasure by itself. It is a funny thing, when the rest of the world prefers going out on Sundays here in Mangalore this day is truly meant for some rest. Most of the shops are closed, most of the roads are deserted. And these days all life and movement happens in the malls. A changing trend, courtesy urbanization of course. Mangaloreans have bowed down to this as well! very interesting post it made Mangalore come alive in front of my eyes,thanx raksha.i am your new follower. Thoroughly enjoyd reading this, esp. since Í'm in Kasaragod for a few days and intend to make a trip to Mangalore one of these days. Will hav to buy an umbrella first! Nice Post :) Being born and brought up in South Canara, I was thinking that is how it is everywhere. 8 years ago, when I came to Bangalore, I could feel the differences you mentioned here..but I was thinking otherwise :) For me, Bangalore and its ways were different from usual then! It's a city with lot of character. It was fun reading about it. i came here in 99, studied to be a doc here, would return every 6 months during my pg and spend atleast a day here.. and came back as asst professor as well to this place.. it just draws you in... such a wonderful city.. having the good qualities of most metros without any of the negatives. aaaaaaaah it was so refreshing reading about my hometown. felt like had ad rive through the town had falooda at pabbas and went home to bejai!. Gr8 visiting your blog after long Raksha.